In a bowl, combine garlic, ginger, pepper, mustard and salt. Rub all over the surface of the pork roast. Refrigerate overnight, up to 24 hours. Heat a tablespoon of olive oil in a skillet. Brown all sides of the roast well. Place meat in crock. Mix together the soy sauce, sherry, brown sugar, chicken broth and anise. Pour into skillet and deglaze the pan. Empty contents of skillet into the crock over the meat. Slow cookers, like ovens, vary in how hot they cook. Because pork can easily dry out you may want to check your dish after about 5 hours and see how it tastes then gauge from there. 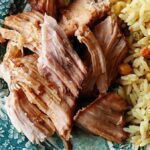 This recipe for Slow Cooker Oriental Pork Roast was printed from AmandasCookin.com - https://amandascookin.com/slow-cooker-pork-roast-oriental-style/ and can only be printed for education or personal use.